A Dinner in Providence...and a couple of plugs! 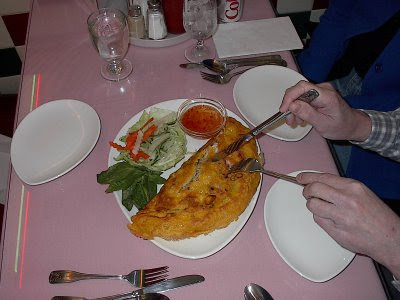 None of the others had tried Vietnamese cuisine before. Will said that he thought it looked like a gigantic taco. The rest of the meal was delicious too...as always! We were gabbing about the rarity of certain records when I mentioned that a copy of Sun To Sun Blues by Blind Blake had recently been discovered...it had been a "lost record" until then. One of the Brown professors, a hot jazz fanatic, mentioned that he wasn't too familiar with Blake. I said I had a good session for him to check out...and here it is. Chicago, ca. 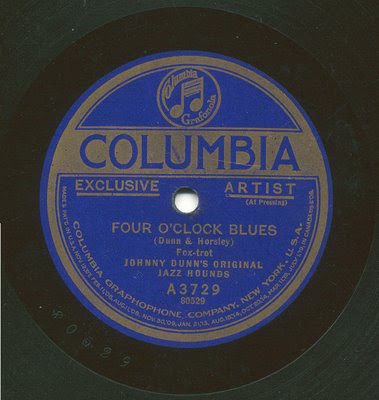 April 1928: Johnny Dodds, clarinet; Jimmy Bertrand, xylophone, slide whistle, woodblocks and speech; Blind Blake, vocal & guitar. An unusual, free-wheeling session. Dodds's presence is always welcome (although he's not on the first side), and Bertrand's contributions are a lot of fun too. Blake (born Arthur Blake, although there is evidence that implies that his real last name may have been Phelps) was one of the best guitarists ever...very nice, ragtime-influenced playing. Good singer too! By the way, a C. C. Pill was a Compound Cathartic, a fairly powerful laxative. Somehow one of us (probably Will) mentioned Jo Stafford...and her hit version of Shrimp Boats came up. I said that I thought the best version of the song was by Jerry Jackson. None of the others had heard it. This record didn't do all that well when it was issued in the middle of 1964, but apparently it's still a dance favorite in the UK now. I can see why. For many years I've treasured an old mono Columbia 45 of this song...when I poked around on the 'Web, I found this stereo version! I think it's a bit better than the single! Another record I mentioned was what is probably my favorite doo-wop side. To be sure, there are better ones out there...but I love this one most (probably because I've had it since I was five or six years old). 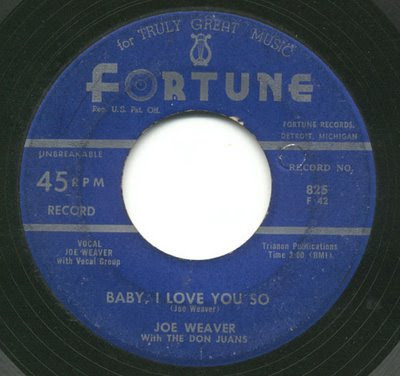 So many things are going on musically...that jangling piano in the background...the group, with a doo-doo-doo bass singer and that falsetto, all backing Joe Weaver's lead vocal, which was truly great, as the label said. 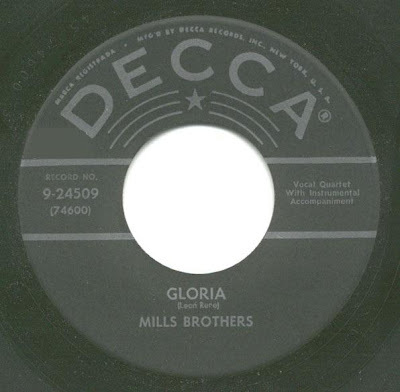 While I'm at it, I think I'll include this little gem for the other doo-wop collectors I know in the southern New England area...they all know and love the 1954 Cadillacs' version of Gloria (The 1960 version by The Passions is also a favorite...). I wonder if they've ever heard the 1948 record of the same song by the Mills Brothers. It's just as pretty, in my opinion. 22 September 1948: Harry, Donald, Herbert and John (Sr.) Mills, vocal quartet. Yeah, I know this is a mid-1950s repressing...but it sounds better than shellac ever did! It's nice that Decca retained the original serial number, though. I'll inaugurate the Pairs section with a couple of songs about the hour of 4:00. NYC 21 September 1922: Johnny Dunn, cornet; Earl Granstaff, trombone; Herschel Brassfield, Rollen Smith, reeds; George Rickson, piano; John Mitchell, banjo. It's a pleasant little number. But does it sound familiar, especially to you country blues nuts out there? 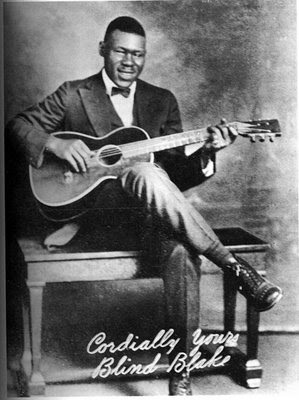 Dallas, 19 June 1937: Robert Johnson, vocal & guitar. Notice that this song is also about 4:00! My guess is that Johnson was familiar enough with the Dunn record to write his own lyrics to it...probably a few years before. Hmmmmm...let's make this pair a threefer! Here's the Original Memphis Five doing their cover of the Dunn title. 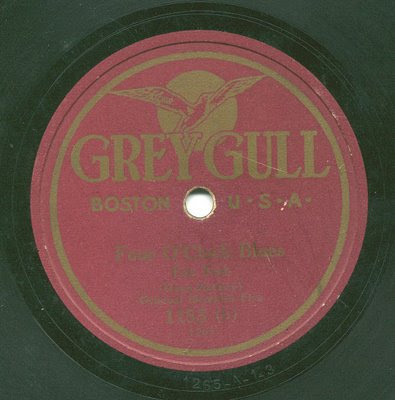 This Grey Gull is from a master leased from Paramount. NYC, December 1922: Phil Napoleon, trumpet; Charlie Panelli, trombone; Jimmy Lytell, clarinet; Frank Signorelli, piano; Jack Roth, drums. I found yet another version as this was going to press...a vocal version (with the original lyrics! Lucky that Johnson probably never heard this one, or his record could have been very different! )...I suppose it's fitting that there should be four Fours. NYC, c. early March 1923: Esther Bigeou, vocal; accompanied by Rickett's Stars: Bob Ricketts, piano; others unknown. Here's another pair...two completely different songs with the same title! Do you know this side? NYC, January 19, 1928: Louis Metcalf, Bubber Miley, trumpets; Joe Nanton, trombone; Barney Bigard, Otto Hardwick, Harry Carney, reeds; Duke Ellington, piano; Fred Guy, banjo; Wellman Braud, bass; Sonny Greer, drums. I can see you now...saying to yourself "Hey...that's East St. Louis Toodle-Oo!" You're right, of course. Why the retitling? In the late 1920s, Duke Ellington made dozens of sides for several labels...usually under a pseudonym (He was under contract to Victor, but that didn't stop his aggressive manager, Irving Mills, from getting his best client some extra recording work). Most of Duke's OKehs were labeled as by The Harlem Footwarmers. 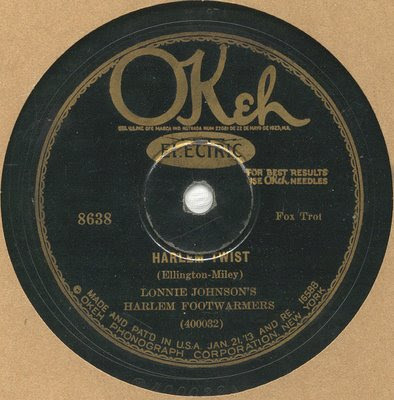 On one of those sessions, guitarist Lonnie Johnson sat in, and those sides were issued as by "Lonnie Johnson's Harlem Footwarmers." 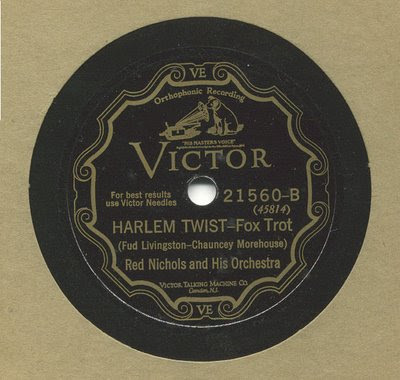 NYC, 21 June 1928: Red Nichols, Leo McConville, trumpets; Miff Mole, trombone; Dudley Fosdick, mellophone; Fud Livingston, clarinet & tenor sax; Arthur Schutt, piano; Carl Kress, guitar; Chauncey Morehouse, drums and vocal. ...and, since you've been very, very good, you may have a dessert! A wafer-thin mint! A couple of weeks ago I found several twelve-inch records by the Paul Whiteman Orchestra (the picture below was snapped moments before I found those records) Included therein were some of the fairly common ones (The 1927 recording of Rhapsody In Blue [with Gershwin at the piano], for example), but there were several that I've never seen except in collections (all three Columbia records to Gershwin's Concerto in F were in this stash). Anyway...I transferred all of them within the past couple of weeks. While recording each side, I was checking the discography for the recording dates. I was surprised to find that the first two sides of the following were recorded on 13 March 1928, the day my mom was born! That's an odd coincidence, considering I had already posted several early 1928 sides the last time around...but I could never find anything from the actual 13 March date. Here's the complete recording of the rarely-heard Metropolis, composed (originally for solo piano) and orchestrated by Ferde Grofe (Two of its themes, however, were provided by fellow Whitemanites Matty Malneck and Harry Barris.). It was originally issued on two records (Victor 35933 and 35934), and the first two parts were indeed recorded on 13 March 1928 (I heard that composer Maurice Ravel attended this session, but wasn't exactly thrilled by what he heard.). Part 3 was recorded the next day (14 March) and the finale on 17 March. Metropolis is a classic genre-straddling piece...it's an epic "concert jazz" item, much in the Gershwin Rhapsody tradition, and paving the way for Grofe's later Grand Canyon Suite. I'm aware that this kind of "concert jazz" isn't for everybody. Even I have to be in the mood for it. In any case, the virtuosity of the Whiteman band, and especially pianist Roy Bargy, is to be commended. They blast through the tricky score with nary a clinker. Oh, listen for a few quick bars played by cornetist Bix Beiderbecke (he's the fourth voice in the fugue section...at 10:55). I took the liberty of combining all four parts into one file. It's fairly obvious where the original side breaks were. I'm also borrowing the image from the poster to Fritz Lang's classic motion picture of the previous year. 13-17 March 1928: Paul Whiteman, conductor; 24-piece orchestra. That's enough for now...keep watching the skies.